When Morrissey was announced as the curator of this years Meltdown you'd have put money on it that Echobelly would have played in support of their new album "Gravity Pulls", which to date is only available in the UK through import on Amazon. After speaking to front woman Sonya Aurora Madan it becomes clear that she's gone through her life laundry and thrown away 60% of everything she owns. In 2004 she's more relaxed than ever and despite trials which have seen the bands former accountant steal a reported half a million and leave them penniless they've picked themselves up, dusted off and returned with an album which looks introspectively rather than the bombast of old. Read on for the only UK interview with the band you'll read this year. Q: You did some low-key live dates recently supporting other bands. How did they go after what seems like an eternity since the last tour? A: We did Bristol which was brilliant, Leicester which was pretty average and then Portsmouth which was absolutely brilliant...and then it just stopped (laughs). The thing is we haven't actually played these songs ever, so we wanted to test them out rather than just going straight away and doing a tour. It went pretty well considering we'd only rehearsed for a few days before. A: No. We just rang them up and said can we just come along and play, which they were a bit confused about. We just wanted to be on the bill with the other bands so nobody knew that we were doing it. But Portsmouth was pretty sold out so they must have known. It was kind of funny at that one because as soon as the headline band came on everybody left (laughs). It's always weird to play new songs, especially to people haven't got the album yet. But people were listening and were really into it. It was a good sign. Q: How long has it actually been since you last toured the UK - one or two years? A: Somewhere in-between. It's kind of hard for us because we decided we don't want to sign to a major. We started out label and then we had that money stolen so we started the label without any money which was kind of a joke. But we ploughed through and kept going. We did this licensing deal with an American label and they've released the album a few weeks ago out there. It's starting to get a buzz over there on college radio so fingers crossed it will do something out there. Realistically, we used to be signed to Sony, and there was such a lot of money spent on you. You'd be advertised and you'd get a much easier ride. Now I think it's going to have to be much more people discovering the album and word of mouth. Although we're really happy with the quality of the songs, realistically if people don't know its out there it's much harder to move forward. Q: Does it feel strange that it's come out in America before its come out over here? A: It feels very strange. We spoke to a few labels here about what we wanted to do and it's a weird time because Sony have just sacked 1500 people and EMI have sacked loads of people and I think people are just not into doing anything unless it's with a brand new band or a pop act, which is cool because we're not going to do something we don't want to do either. It's better to wait and if there is a buzz in America then it's amazing how the doors open. Q: To try and gauge just how you got the deal Stateside before the UK. How popular are you over in the US? A: We're really lucky because in the mid 90s throughout all that Britpop stuff we went over there 3 times and we got a really good buzz. I got voted in Rolling Stone Magazine as one of the their 5 favourite singers and some really great articles and reviews in the press. We had a really good cult following, but America is huge and it's not like the UK - you just have to keep going back. It's the size of Europe, I mean you can play a show in LA and have all the actors and actress come down and then you do a show in Ohio and it's half empty. It's a very interesting place. Q: Is it a case of the reverse tastes where the Brits are listening to all the American bands and they're doing vice versa? A: No they don't. They've got a very healthy music scene with the same pop element. Westlife or Blue aren't heard of in America, those sort of bands never make it because they've got their own versions. What we're doing is quite different to that so hopefully it's more REM classic band territory. Q: Obviously starting up a record label with no money must have been incredibly hard. Just to inform the readers who don't know the short story is that your accountant robbed a series of bands of which I believe Echobelly lost £100,000. How was that when you found out? A: In the times it said half a million and we never get to the bottom of it because he burnt all the records and he'd been stealing since 1992. When we were at the height of the fame there was a lot of money going in and out. There was 16 different accounts in Dollars, Yen, Sterling and we hadn't got a clue. We just wanted to be in a band, we didn't want to be accountants so we got a manager to take care of all that and he turned out to be absolutely useless. The accountant knew who he could steal from and who he couldn't. Yearly he was taking quite a lot and in fact when it was in court a few weeks ago he pleaded guilty before the trial actually happened so that means there won't be a trial. There will be another date set for sentencing but as far as the money, I don't think we'll ever find it. It was hilarious. He was screwing his secretary who was in on it. He was married to a lawyer who should have known better. The whole thing was like something from a film. We'll put it down to experience. Q: How does it feel though knowing that you've spend so many years working and it's all just gone? A: I remember when we started the label. It was the year 2000 actually, it was the weirdest time. My best friend killed himself, we'd left Sony and we were all very confused about what was going on. Everything was going down, a real sinking feeling, and we got a call from one of the people working there asking us to come into the office. We went in and he said "I don't know how to tell you this" and then told us about what had been happening. And then Glen was told he had £200 in his account and he thought he had 70 or 80 grand in there at least. All of a sudden it was like what else can happen now (laughs). We did just laugh at the time in the disbelief at the farcical nature of the pop music business because you don't have to be qualified. If you went for another type of job you'd be expected to have certain qualifications, but the music business there are so many charlatans, it's hilarious. A: What's really interesting is to step out of yourself and see that it hasn't affected our ability or desire to create. It's gone and shown us that we're not here for the short term. We actually are artists and musicians and regardless of the whims of the business and the general populous we are here to make music. I think most of our contemporaries have split up or had major arguments but myself, Glen and Andy are closer than ever. We're making music that we're really happy with although obviously we'd like to sell and come across. When it comes down to pure art form of writing songs we're happier than ever. You don't actually need that much. There was a period of time in the late 90s where there was a lot of money coming in and yet I can honestly say I wasn't happy. All you do is go out on shopping sprees and spend money on things you didn't need and still not be happy. Since then i've thrown away 60% of everything I owned. I just had a massive psychological clearing out and I feel a lot lighter and happier for it. All you need is your ability to create. Q: "Gravity Pulls" album is a mellower, soulful, more introspective album than we've heard before from Echobelly. In the past we've seen touches of it before on album tracks, this album it all flows together and there isn't the big crashing single. It's definitely an album buyers album isn't it? A: Which we were never allowed to make before. There's always a pressure on bands to come out with singles. But I mean in America people don't even release singles unless they're pop acts. On this album there are elements of the old Sonya on "One In A Million", with it's slightly cutting lyrics but at the same time you have to go with what feels natural for you. I'm not the same person I was nine years ago or whatever. I don't have to prove anything to anyone anymore. In a way if you cut away all the crap and find you can still write it's really a cool thing to do. Of course you get the nervousness about money and recognition, but at the same time there's a wonderful sense of being allowed to be yourself. The freedom of expression is better now. Q: On reviews of the recent shows I read you only did 2 old songs. Are you trying to break away from the past? A: There's no point in doing Greatest Hits, it's too long ago. We're not here to just squeeze little bits of money out from the past. We're actually creating now, so that's who we are now and that's what we do when we play live. 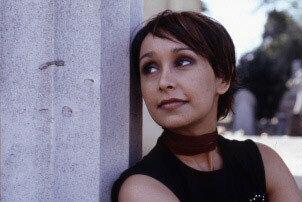 Q: When you write songs now are you permanently in this head space or do you ever write what people would consider old skool Echobelly songs, but put it to the side as its just not you? A: Glen's always coming up with tunes. He's vary tough with himself and discards a lot. Really fantastic tunes, but they just wouldn't fit in with this album. He's still got that pop sensibility, he never really lost it. But he's also tuned into different things. In the last couple of years he's really got into jazz and indian classical music and I think that's influenced him as well as far as the music is concerned. Q: Despite the fact that the albums only just came out, it was actually recorded this time last year. Are you writing at the moment for the next album? A: We're talking about starting writing again. I suppose that's harking back to the time when you had a system where you wrote, you released, you toured and promoted, you had a break and then started again. We're toying with the idea of writing again. Q: Are you heading over to the states to tour the album? A: We'd like to. But again the situation is because we are the label we have to supply the money (laughs). Also now with all the terrorist stuff you have to pay for work permits to go and play in America and they cost a few thousand of pounds. We'll have to have a reason to go out there, you can't just turn up and play toilets. I think it's going to have to build up, at least on college radio, before we go out there. If we went out there now it would be too early.